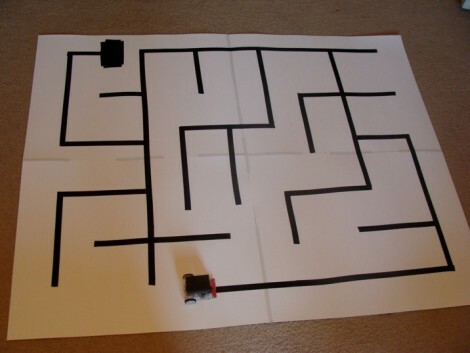 [Patrick McCabe’s] latest offering is a well-built maze-solving bot. This take on the competitive past-time is a little more approachable for your common mortal than the micro-bot speed maze solving we’ve seen. Don’t miss seeing the methodical process play out in the clips below the fold. The playing field that [Patrick’s] robot is navigating is made up of a electrical-tape track on a white background. The two-inch tall double-decker bot is every economical. It uses an RBBB Arduino board to read an optical reflectance sensor array made by Pololu, then it drives a couple of geared motors using an L293D h-bridge breakout board. But we already know that [Patrick’s] a talented robot builder, this time around we’re happy to see his in-depth discussion of how to program a robot to solve a maze. In it he covers all of the different situations your robot might face and how to deal with them. Once you’ve dug through all of the concepts, dust off that bot you’ve got lying in the corner and start writing some new firmware. Modern Device’s Really Bare Bones Board is an Arduino clone designed to have an incredibly small footprint. It’s barely wider than the requisite AVR and is laid out so you can reduce the size even further. Don’t need the power connector? Just snip it off. Don’t need the voltage regulator? That can be removed just as easily. The kit is only $12 and all through-hole components. [youevolve] posted a build guide that shows exactly how easy it is to assemble.